TransferMate has a cloud based foreign currency API that can integrate with any partners software. If you are interested in developing a solution for your clients using our international payments functionality let our team know. Below are a list of the latest accounting softwares to be able to integrate with TransferMate providing a seamless payment experience. Connect Transfermate with the other products you run your business on. Find out how we connect with your accounting software to save you time. Does your business use QuickBooks Accounting Software and make international foreign currency payments? 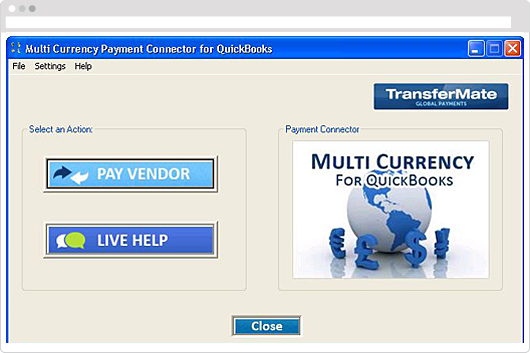 Like many QuickBooks users you may make payments in several currencies to pay vendors/suppliers invoices. If so this free add-on is simply a must and will guarantee to save you time and money on all of your foreign currency payments. Today, QuickBooks users typically have to engage in unnecessary double entry processing invoice payments one by one using their bank and then having to manually re-enter payments back to their QuickBooks accounting software. Using this great add-on purpose built for QuickBooks by our team you can now at the click of a button pay hundreds of invoices instantly, providing your team with enormous time savings. In addition you also secure better exchange rates and lower transfer fees than using the bank so in addition to time savings you also save a lot of money. Does your business use either Sage 50 Accounting Software or Sage 200 Accounting Software and make international foreign currency payments? 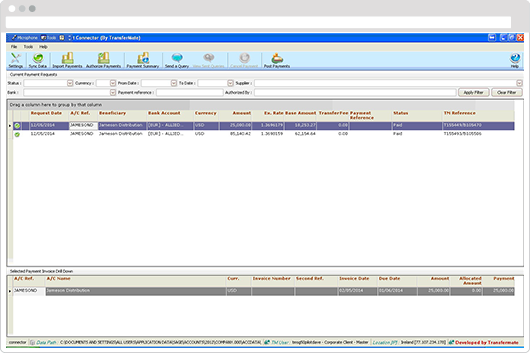 Like many Sage users you may make payments in several currencies to pay vendors/suppliers invoices. If so, this free add-on is simply a must and will guarantee to save you time and money on all of your foreign currency payments. Today, Sage users typically have to engage in unnecessary double entry processing invoice payments one by one using their bank and then having to manually re-enter payments back to their Sage accounting software. 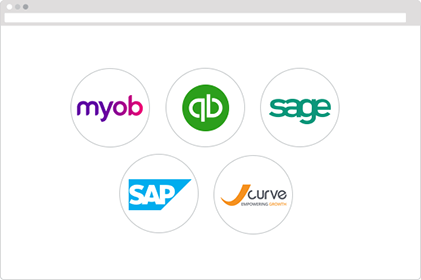 Using this great add-on purpose built for Sage by our team you can now at the click of a button pay hundreds of invoices instantly, providing your team with enormous time savings. In addition you also secure better exchange rates and lower transfer fees than using the bank so in addition to time savings you also save a lot of money. Does your business use MYOB Accounting Software and make international foreign currency payments? 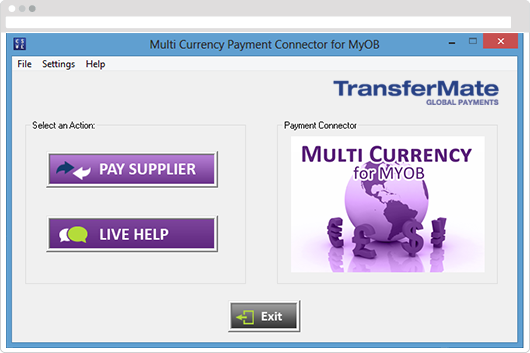 Like many MYOB users you may make payments in several currencies to pay vendors/suppliers invoices. If so this free add-on is simply a must and will guarantee to save you time and money on all of your foreign currency payments. Today, MYOB users typically have to engage in unnecessary double entry processing invoice payments one by one using their bank and then having to manually re-enter payments back to their MYOB accounting software. Using this great add-on, purposely built for MYOB, you can now at the click of a button pay hundreds of invoices instantly, providing your team with enormous time savings. In addition you also secure preferential exchange rates and lower transfer fees* than using the bank so in addition to time savings you also save a lot of money! Does your business use SAP Business One Accounting Software and make international foreign currency payments? 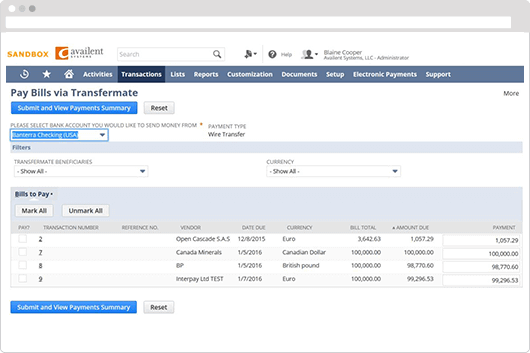 Like many SAP Business One users you may make payments in several currencies to pay vendors/suppliers invoices. If so this free add-on is simply a must and will guarantee to save you time and money on all of your foreign currency payments. Today, SAP Business One users typically have to engage in unnecessary double entry processing invoice payments one by one using their bank and then having to manually re-enter payments back to their SAP accounting software. 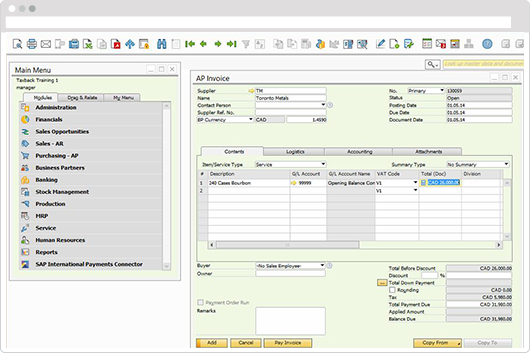 Using this great add-on purpose built for SAP Business One by our team you can now at the click of a button pay hundreds of invoices instantly, providing your team with enormous time savings. In addition you also secure better exchange rates and lower transfer fees than using the bank so in addition to time savings you also save a lot of money. Does your business use JCurve Accounting Software and make international foreign currency payments? Like many JCurve users you may make payments in several currencies to pay vendors/suppliers invoices. If so this free add-on is simply a must and will guarantee to save you time and money on all of your foreign currency payments. Today, JCurve users typically have to engage in unnecessary double entry processing invoice payments one by one using their bank and then having to manually re-enter payments back to their JCurve accounting software. Using this great add-on purpose built for JCurve by our team you can now at the click of a button pay hundreds of invoices instantly, providing your team with enormous time savings. In addition you also secure better exchange rates and lower transfer fees than using the bank so in addition to time savings you also save a lot of money.